In 1908, Dr. A. Waldo Stevenson, while crossing the Penn Campus, chanced upon a group of Chinese students. Striking up a conversation with them, he learned that he was the first Philadelphian to befriend them. He was touched by their evident loneliness and invited them into his home where he learned more of their unhappy situation and of others like them. Dr. Stevenson began entertaining foreign students in his modest apartment. By 1910, his efforts had expanded so much that he took the problem to the Christian Association of the University of Pennsylvania, which adopted his work as an active program. 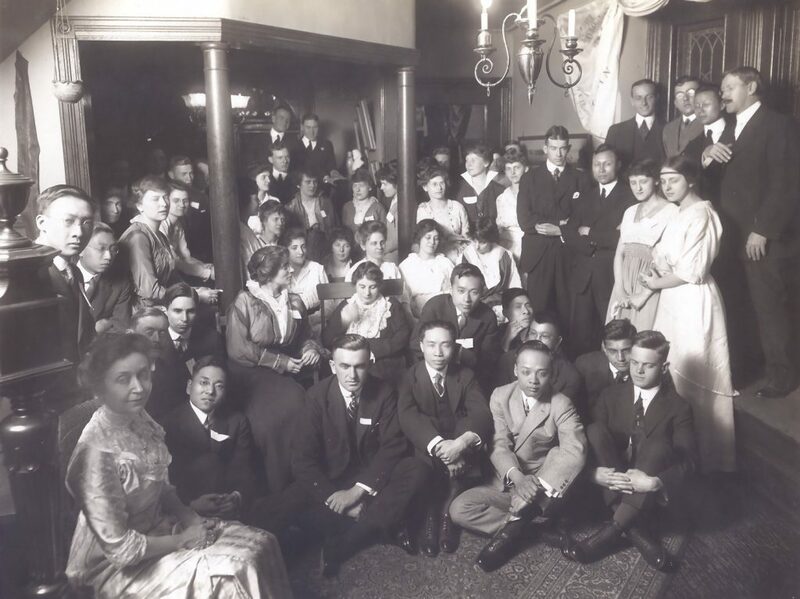 In 1917, the University purchased the property at 3905 Spruce Street, and on January 1, 1918, Philadelphia’s International Students House began its operations. Now, after a ten-year sojourn at 15th and Cherry Streets, International House is again on campus. Welcome back. A.W. Stevenson, a graduate of the College and at present secretary for the foreign students at the University, will be to-day’s speaker at chapel. Mr. Stevenson has for a number of years done considerable work along social lines. He was a missionary to Cuba, and at the site where the University House is at present he organized missionary work. The latter continued until his connection Pennsylvania, four years ago. On numerous occasions during the past few years Mr. Stevenson has given his home on Larchwood avenue openly to the foreign students for get-togethers. He has held socials and entertainments in Houston Hall and other homes, and has been the center of a great deal of congenial spirit existing among the men from the far-off countries. Through the efforts of the Christian Association of the University, a Home for Foreign Students was opened New Year’s Day at 3905 Spruce street. Although most colleges and universities in the past have had comfortable headquarters for the students from far-off countries, Pennsylvania was laboring at a disadvantage in this respect until William M. Potts, an alumnus, practically gave $30,000 to start the movement. He sold his home, worth $50,000, for the reduced sum of $20,000, thereby making his contribution about $30,000. Mr. Potts is a director of the Fourth National Bank and president of the Enterprise Transit Company, both in this city. Dr. A.W. Stevenson will be in charge of the new home. Dr. Stevenson has been quite successful in the past four years while acting as secretary for the foreign students. On numerous occasions he entertained at his home and in Houston Hall, but as both of these places were unsatisfactory for several reasons, the new headquarters are welcomed all the more by the foreign students. Rooms throughout the building will probably be equipped as memorials by alumni and other Philadelphians interested in the furthering of cordial relations among foreign students. On the first floor there is space for a huge reading and lounging room, and fifteen other large rooms on the upper stories will be equipped for living rooms. A dining room will also be arranged. Wilfred H. Schoff spoke in the afternoon also, using as his subject, “Latin America as a Factor for World Freedom.” Dr. Schoff is secretary of the Philadelphia Commercial Museum and as consular representative of some of the South American Republics, has been for a number of years in close contact with Latin American affairs. After fourteen years, Mr. and Mrs. Stevenson are retiring from the International Students’ House. In the college year 1911-1912 they began in their own home this work of cultivating friendly international relations. This endeavor began at first with a Friday evening social gathering of students and American friends, which has since become a regular weekly function, and which has been held quite regularly every Friday evening during each college year. In those early [years] the conviction soon grew in Mr. Stevenson’s mind that, in addition to those weekly social functions, there was need of a larger social headquarters, where the students from abroad could meet each other daily and where the different nationalities could hold their own club and social meetings, and also meet with Americans around the dinner table. It took six years to cultivate in the minds of Philadelphians the idea of an ‘International House,’ to be typical, as far as possible, of an American home. For years a house was vacant on Spruce Street, which had been the Potts family mansion. It seemed admirably adapted for this particular purpose, and was a dream in Mr. Stevenson’s mind. During that whole length of time he had regular recurring interviews with Mr. W[illiam] W. Potts, who owned this old homestead. Finally, Mr. Potts was so impressed with the idea that he sold the old mansion, which had cost originally over $100,000, to the Christian Association for $20,000. This represented a gift by Mr. Potts of about $30,000, as the property was assessed at $50,000 by the city. The work was transferred there on January 1, 1918, and after having passed through seven successful years it seems assured that the idea of the International House has now planted itself in Philadelphia’s thought. The House has endeared itself to Americans as well as to those from abroad. Its associations have woven themselves into the life and thought of many who have found here the opportunity to form life-long international friendships. Many distinguished visitors come from week to week to the International Students’ House on the campus of the University of Pennsylvania. One Friday night last May, Mr. Sebastiao Sampaio, attache of the Brazilian Embassy at Washington, was a guest of honor. The same evening a varied and interesting program of peasant music and folk dances was being given by a group of Ukranian students in illustration of life in their part of the world. Mr. Sampiao had been a student in Europe, and entered heartily into the fun of the evening. He also gave a glowing account of the preparations for the approaching celebration in Brazil of the Centennial of Independence. At a late hour of the Sunday evening of that same week came a call from the headmaster of a large normal school in Japan, Dr. H. Hishinuma, a former graduate of the University of Chicago. He had been sent by his government to study the normal school systems in this country. A guest room was available at the House. By telephone two of the leading Japanese students were reached, and came for a conference, one of them a former pupil of the visitor in Japan. The next day Mr. Hew Fan Un, one of the managers of the Bank of Canton, China, a delegate to the International Trade Convention meeting here, came to get in touch with some of our students from South China. It did not take long to find one from Hong Kong in the Dental School, and also another from Canton in the Architectural School. In a little informal dinner group, Mr. Un met his fellow countrymen. On the same evening were present in another dinner group wo recent graduates of a Western College, who were passing through on their way to educational and missionary work in India. The next day a student from Chile, who had just completed a course of studies in Oxford and Cambridge, and at the Sorbonne in Paris, was our guest at dinner to meet some of the students from South America. These are glimpses of just one week’s visitors. The University of Pennsylvania has always been a cosmopolitan institution. Nearly fifty nations are represented in the student body each year. Many are graduates of universities in their home lands, or are sufficiently prepared to enter here with advanced standing. A very large proportion of those who have returned to their native lands are now occupying positions of highest power and influence in the commercial life or government service there. These students from abroad, therefore, do occupy a strategic position in the work of developing friendly international relations. In order not to neglect this field of opportunity, a considerable number of friends and of the University, alumni and their wives and others, have for several years past been inviting to their homes in the city and in the suburbs some of these splendid students, not only to be of service to them, but also because they have found that through such contacts they are enriching their own lives by a wider and more enlightened world vision. Five years ago, to broaden this work of international hospitality, a most desirable piece of property was secured, partly as a gift of Mr. and Mrs. Wm. M. Potts. It is virtually on the University campus, at 3905 Spruce Street, and is a fine type of old Philadelphia mansion of fifty years ago. This has now become an International Student Headquarters, around which much of the social life of foreign students has revolved. It serves as a meeting place for the different national groups and as an auditorium for international entertainments and conferences. The object, however, is not to make this House simply a club for these men from afar, but, as far as possible, to make it a typical American home, representing through it the hospitality of the City of Brotherly Love. The Women’s Hospitality Committee, the members of which have already been opening their own homes, desire through this ‘clearing house’ to maintain continual hospitality throughout the year to foreign visitors and students. 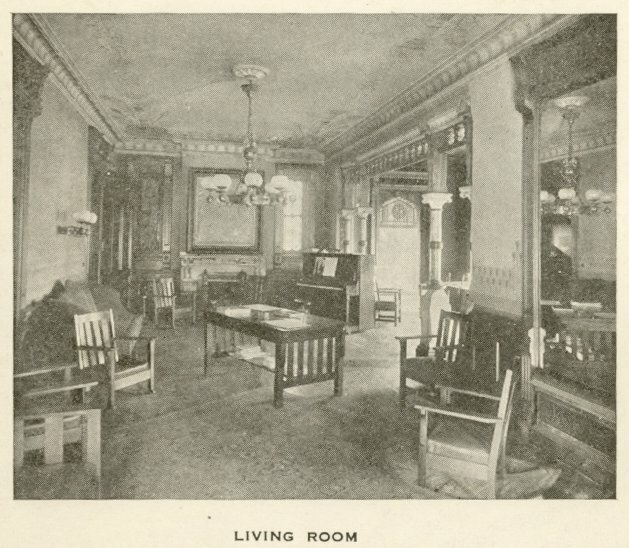 The Secretary and his family, Mr. and Mrs. A. W. Stevenson, live in the second floor apartment, preside in the dining hall, and reproduce so far as possible the atmosphere of a home, in the hope that the loneliness of living in a foreign land may be somewhat mitigated through the friendships formed here. Under the direction of the Secretary, programs are arranged for ‘Open House’ gatherings every Friday night. These entertainments during the past year have presented such varied aspects as a ‘Japanese Night,’ a ‘Chinese Night,’ a ‘Russian Night,’ and other special evening programs, arranged by the students of Ukraine, Rumania, and Chile; also special evenings of music arranged by the Matinee Musical Club and other such organizations, as well as by many prominent musicians who have volunteered their services. “International House, 1959-1986.” News Bureau Collection (UPF 8.5), Subject Files, Box 138, File Folder 4. Christian Association booklet entitled Christianity and the College Man and published in 1922, pp. 10 and 11 (see photocopy in the Alumni Record File of Alphaeus Waldo Stevenson, 1883 A.B.). Plan 20 S 9, Lots #123 and #124. The Alumni Register of the University of Pennsylvania, June 1925, pp. 649-50. Catalogue of the University of Pennsylvania [for] 1911-1912 Philadelphia: Published by the University, February 1912), pp. 568-70. Also the Catalogue for 1914-15, pp. 545-46, and the Catalogue for 1915-16, pp. 562-64. The Pennsylvanian, 18 December 1917, 3 January 1918.